In a small mixing bowl stir together sour cream, mayonnaise or salad dressing, orange juice concentrate, and if desired, poppy seeds. 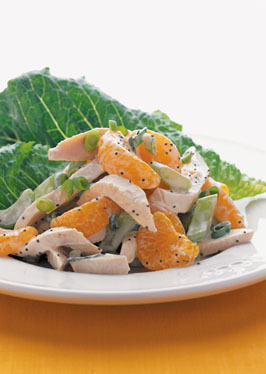 In a large mixing bowl toss together the chicken strips, orange sections or pineapple chunks, celery, and green onions. Pour dressing over chicken mixture; toss lightly to coat. Season to taste with salt and pepper. Serve on lettuce leaves.